Arancini is an Italian dish said to have originated in Sicily and is typically served in the Sicilian port city of Messina. 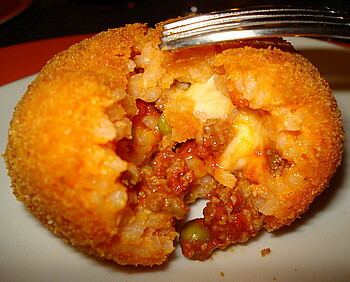 The meal is fried, stuffed, rice balls which are coated with breadcrumbs and filled with meat sauce, tomato sauce, mozzarella cheese, and peas. Some other variations also include mushrooms, pistachios or eggplant. The ingredients include vegetable oil, 2 large eggs, beaten, 2 cups Risotto with mushroom and peas, ½ cup parmesan, grated, 1 ½ cups bread crumbs, salt, and 2 ounces mozzarella, cubed. For the rice mixture all that is needed is 500g of risotto, chicken or beef stock, 1 tablespoon of butter, 1 medium egg and ¾ cup Parmesan. To make the risotto melt butter in a large pan add rice and fry for a few minutes. Add stock and stir into the rice until cooked. Leave to cool at room temperature. Then combine eggs, risotto, parmesan, and bread crumbs. Fold mixture into balls and coat with remaining bread crumbs. Place one mozzarella cube in the centre of each ball. Add oil to a large saucepan and heat over medium flame, add balls and fry until golden brown. Add salt to taste.